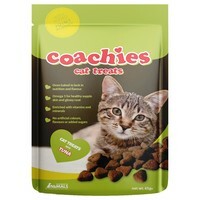 Coaches Cat Treats with Tuna are delicious, highly palatable and low calorie natural treats for your cat. Packed with shrimp, each treat has been over baked to lock in the goodness and contains a rich source of phospholipids to help maintain healthy joints and good mobility. Omega 3: For healthy supple skin and a glossy coat. A palatable treat with fortifications particularly suitable for older cats. Given as a gift to my colleague's kitties and received with purrs!